Adam Savage recently built his own flawless replica of Kirk’s captain’s chair, but the talented designers behind Super-Fan Builds have taken that idea to the next level by turning the entire USS Enterprise into a glowing computer desk and office chair that looks ready to hit warp nine. The most recent episode of the web series features a Star Trek super-fan named Jake Geiger who even has Spock tattooed on his leg. That’s dedication. He also happens to work as a designer, so it was only fitting that his home office (and personal Star Trek museum) get upgraded with this amazing desk and chair. 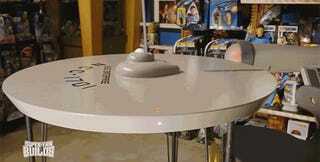 You can’t help but wonder what working with the USS Enterprise’s reflector dish between your legs must be like, but it would be hard to find a reason to complain with this much awesomeness sitting in your office.